I suffer from a back disease and I have a support for my desk chair and my truck, but at home, it's hard to find something that will be comfortable, yet supportive. Now, I've found it! 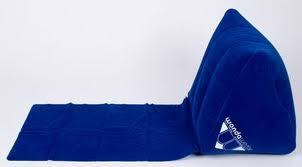 The WondaWedge is an inflatable pillow with an attached mat. I have used the heck out of mine since I got it in the bedroom. After a long day at work, I just want to relax and either read (BookWedge) or get on the computer. But pillows are really soft and squishy and don't give much support. But if I put the WondaWedge at the head of my bed, I am able to stretch out my legs, while having back support. It's really heaven!! My daughter is already talking about me getting her one for Christmas so she has one to take to the beach next summer. With the attached mat, you just sit on it, your back is supported to relax and the best part is that it's not supposed to stick to sand. I can't test this out because it's like twenty degrees out. My son has borrowed it on occassion to put on the floor for gaming purposes and to watch television. 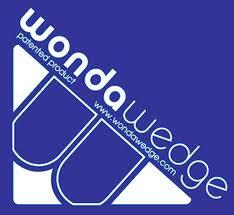 I can see the WondaWedge being used for multiple purposes and with it's lightweight, it's easily transportable. It also comes in a variety of colors and is really soft material - no scratchy stuff! We love it and highly recommend it! One lucky reader will win their own WondaWedge!